Culture Amp is adding nuance to the simple diversity statistics currently used to evaluated a complex problem. Many companies report diversity in terms of the number of diverse individuals they employ in their organization, but these numbers are one dimensional. The companies often do not capture the number of women who work within a technical role, such as software engineering, as compared to a support role within the company, and do not capture employees’ perception of the work environment, despite survey results showing that men and women experience company culture differently. 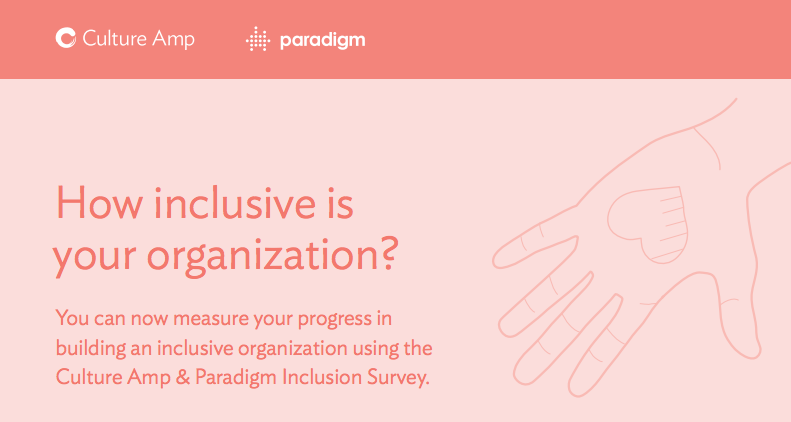 The Inclusion Survey is unique in its sole focus on employees’ feelings of inclusion within the workforce and its focus on tech companies. Its methods are research-backed and grounded in organizational surveys, and it goes beyond industry standards to collect robust demographic information (e.g., family status, caregiver status, native English speaker status, as well as different forms of gender identity). It ultimately aims to demonstrate correlation between more inclusive companies and better business outcomes, such as company revenue or Glassdoor rankings, to build the business case for diversity and inclusion. before aggregating its findings into a high-level report to build the business case for diversity and inclusion in tech.